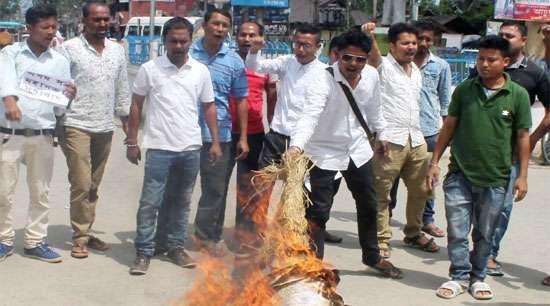 LAKHIMPUR; April 19: With regard to the alleged support to the Citizenship (Amendment) Bill by Asom Satra Mahasabha, Asom Jatiyatabadi Yuba Chatra Parishad (AJYCP) burnt the effigy of the organization in North Lakhimpur town on Thursday. The activists of Asom Jatiyatabadi Yuba Chatra Parishad alleged that Asom Satra Mahasabha had ridiculed and humiliated the supreme sacrifices made by 855 martyrs of the Assam Movement by extending support to the controversial bill which might destroy the indigenous community of Assam. People across the State along with numerous organisations have opposed the Bill.